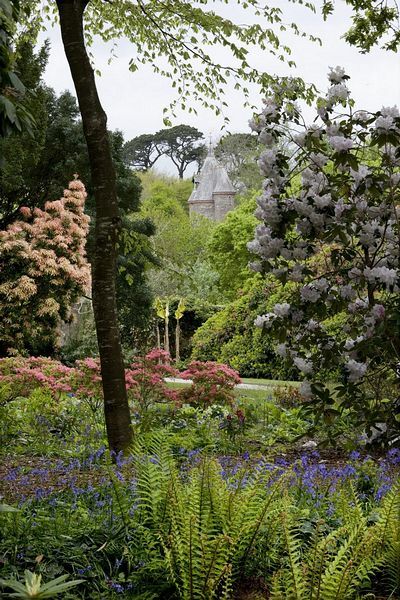 Whether you are visiting Trelissick Garden to see the fantastic collection of plants which thrive in the Cornish climate, or for the splendid harbour views which can be enjoyed from the 500 acres of woodland paths, you are sure to take away plenty of happy memories from this enthralling garden. 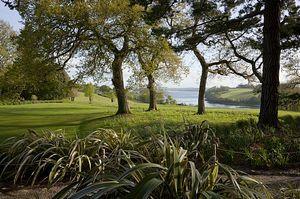 Set around the two-storey country home which is not open to the public, Trelissick Garden covers the extensive wooded slopes which run down to the Fal Estuary and nearby Fal Harbour, one of the deepest natural harbours in the world. Garden, from waiting in line on the Feock slipway on the lovely Roseland peninsula opposite, to disembarking right beside the garden. 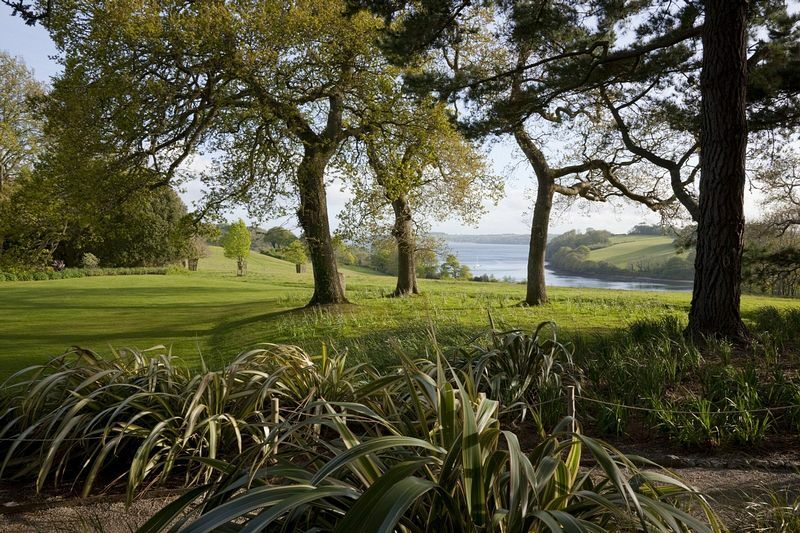 Like many of the Cornish estates, the Trelissick estate was built on money made from tin-mining by the Daniell family. It was bought in 1800 and the house was remodelled by architect Peter Frederick Robinson in 1825 for the son, Thomas Daniell. It was Thomas Daniell who planned and made the curving drives and shady paths around the wooded estate. 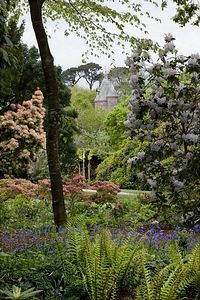 However, apart from the huge holm oaks and established conifers, most of the colourful plantings were done by Mrs Ronald Copeland who inherited the estate in 1937. Her husband, Ronald, was a scion of the famous Spode China business. The shelter belt which protect the tender and exotic Asian plants is provided by a 200 year old hedge which cuts the prevailing winds and allows the azaleas, rhododendrons, eucalyptus, banana trees, maples, ginkgo and tender palms to flourish. There are also some rare species of the hydrangea family which the garden is noted for. The main lawn slopes gently beneath the spreading branches of a Japanese cedar and the borders are filled with bright perennials during the summer. The paths wander off in all directions down to the summer houses which are scattered around the gardens, with continuously ascending and descending levels, revealing ever-changing panoramic views. The iconic water tower on the estate was built for irrigation and fire-fighting, showing it was a forward thinking and well-planned estate. On a clear day it is possible to see the ancient turreted keep of Pendennis Castle in the distance and splendid views of the wide waterway known locally as the Carrick Roads. Although the house is not open to the public, it is possible to prebook a tour of the Copeland China Collection on Thursday afternoons during the summer, which will certainly enhance your visit to Trelissick Garden. NCN3 View local cycle routes on the National Cycle Network website. Link from Falmouth, Truro and St Mawes: Enterprise boats 01326 374241, K&S Cruisers 01326 211056, Newman's Cruises/Tolverne Ferries 01872 580309. 4 miles south of Truro, on B3289 above King Harry Ferry. Truro 5 miles; Perranwell, 4 miles.